Since 1993, nearly 740,000 kids have participated in the Kids Ocean Day beach cleanups to make a difference in taking care of the environment. 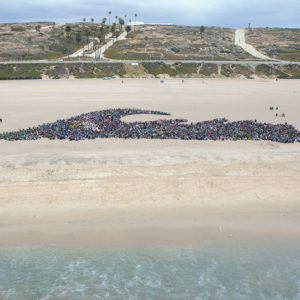 On May 24, another 4,500 students participated in the 25th annual Kids Ocean Day at Dockweiler State Beach. This year’s theme “Kids Making Waves for a Plastic-Free Ocean” illustrated the importance of protecting the ocean and watersheds. Students from Hancock Park Elementary and Crescent Heights Magnet schools participated. The day commemorated the impact children have had over the past 25 years in keeping oceans clean through Kids Ocean Day followed by a beach cleanup. The children also formed a giant aerial “Wave” art piece.